The John and Mary Pappajohn Sculpture Park is a downtown Des Moines landmark. Photo courtesy of Catch Des Moines. Big city getaways are expensive. That’s why smaller towns, like Des Moines, Iowa, are such good vacation choice for families on a budget. In Des Moines, there a ton of fun things to do that are affordable, and in some cases, free. Using input from some hip local moms and dads, we compiled a list of the best free things to do in Des Moines. 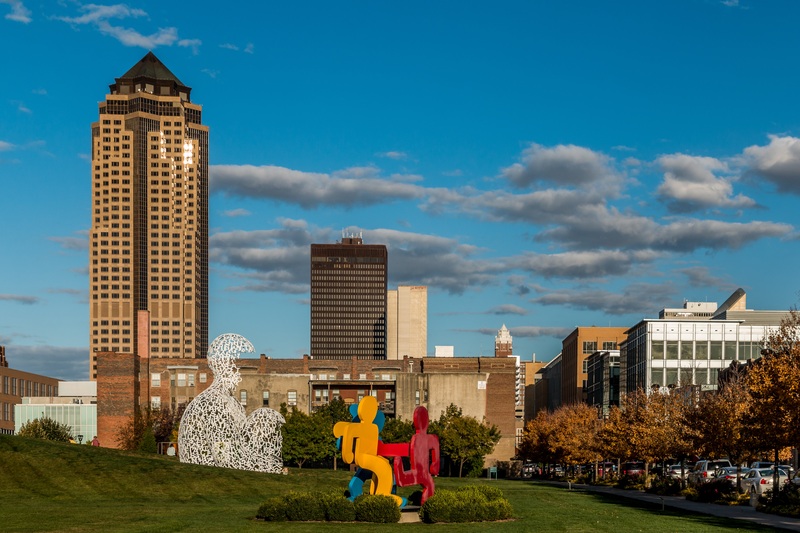 Take a free tour of the sculpture park in downtown Des Moines. Photo courtesy of Catch Des Moines. With so many fun, free things to do in Des Moines, Iowa, this city should be on the radar of any family looking for a budget-friendly Midwestern getaway. About a 5-hour drive west of Chicago, Des Moines (pop. 217,521) has both a big city vibe and small-town charm. A few local friends shared some insider tips to help create this list of 10 top free things to do with kids in DSM, (the town’s nickname, and its three-letter airport code). I also threw in a few family-friendly activities that aren’t free, but very affordable, plus a few unique, inexpensive restaurant recommendations. This list – which includes everything from splash fountains and secret staircases to skateboard parks and sculptures – has something for kids of all ages. Dude! When it opens in the summer of 2019, the 5-acre, riverfront Lauridsen Skate Park will be the largest skateboarding park in the Midwest, and the second largest in the United States. One of its coolest features will be a giant steel sculpture of the word “wow” spelled in cursive. Shredders can skate on the letters’ curves, which are 80 feet long, 12 feet high and four feet wide. The Iowa State Capitol building’s 23-karat gold dome towers over downtown Des Moines. The free guided tours of the building (advanced registration required) might seem boring for kids, but they are not! 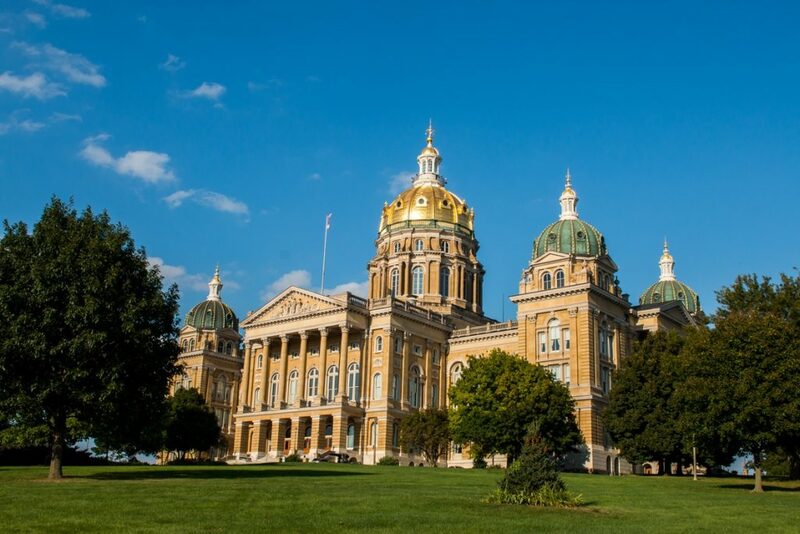 Guides tell funny and interesting stories about Iowa’s senators and history; you climb a secret staircase to the base of the rotunda; experience the whisper gallery acoustics; see a giant model of the USS Iowa battleship; and walk through the stunningly beautiful library with its spiral staircase. That’s in addition to peering into the dome, the governor’s office, and more. The free tours of the Iowa State Capitol Building are very kid-friendly. Photo courtesy of Catch Des Moines. I’m declaring Des Moines the Splash Pad Capital of the Midwest. The city is dotted with unique splash pads/fountains for little kids to run through and get wet. While splash pads are certainly not a year-round activity in Iowa, they are a perfect free activity on a hot summer day. The one next to the John & Mary Pappajohn Sculpture Park, in front of the Central Library, has a long stream and stone bridges over it (throw in a plastic toy and watch it float downstream!). It also has grassy hills perfect for climbing, rolling or racing down. Bonus: there are lots of benches for parents to sit on. The bunny-shaped Miffy Fountain, named for the rabbit in the children’s book series, is not really for splashing but it’s a cute stop on the way to the many free kids’ programs at the Des Moines Public Library. On the east side of downtown, the new Cowles Commons Lauridsen Fountain shoots arches of water up from the ground which kids can run under or through. The splash pad at Greenwood Park, outside the Des Moines Art Center, has big Stonehenge-like rocks that spontaneously squirt water. There’s even one at Des Moines’ Union Park, one of the city’s original five parks. 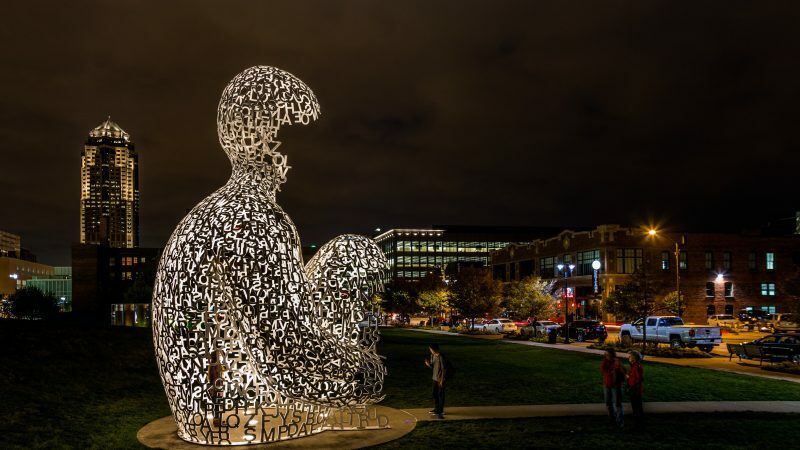 Interesting sculptures and art pieces dot the iconic, 4.4-acre downtown Des Moines park. It’s a great place to take photos, have a little picnic, and let the kids run around the massive lawn. Free audio tours available online will teach you more about the artwork in the Pappajohn Sculpture Park. So will the free guided tours from the adjacent Des Moines Art Center (which has free admission – see below). Walk or bike along this scenic, 1.2-mile loop to see art and unique bridges, including the city’s iconic arched bridge over the Des Moines River. The Riverwalk connects with several other bike trails, if you want to go for a longer ride. Traveling with Instagram-loving teens? They’ll want to take photos of the colorful murals on building walls across town. One of the newest, at the corner of Park and 7th streets, is by local artist Jenna Brownlee and says, “My Heart Belongs to Des Moines.” Preview the many other murals on Catch Des Moines’ Instagram page (they do a “Mural Monday” feature), or visit artroutedsm.com for a map of the murals and the city’s other public art. Wall art murals are all over Des Moines, including this new one by local artist Jenna Brownlee. Photo courtesy of Jenna Brownlee/Catch Des Moines. A free thing to do indoors is the Des Moines Art Center, next to the Pappajohn Sculpture Park. Free admission lets you see the collection of mostly modern and contemporary art, as well as paintings by famous artists like Georgia O’Keefe and Edward Hopper. A good lineup of free kids programming includes Art Spectrum, which use sensory experiences to foster creativity. Outside the Des Moines Art Center is Greenwood Park. You can do a little urban, wooded hiking, spot frogs in the park’s little pond, or play on its nice, new playground and splash pad (mentioned above). Read More: More Cool Free Stuff to Do in Iowa! Free events and festivals, usually with food and live music, take place almost every warm weather weekend across Des Moines. Highlights include the Des Moines Art Festival in June, CelebrAsian in May, and the World Food and Music in October. For an up-to-date listing, check here. It’s fun to walk around the East Village neighborhood, known for its antique stores, ethnic restaurants, and Sunday bazaar. One standout store is Raygun, a two-story space selling things like Ruth Bader Ginsburg ornaments and other items with politically left, Midwestern or Iowa-centric humor. Kids can hang out in a little play area while parents shop. In the little attached coffee shop, try Des Moines’ famous Thelma’s Ice Cream Sandwiches (the snickerdoodle cookie with vanilla ice cream is highly recommended). Admission is free, and you can see 1,500 artifacts that teach you about Iowa’s growth, famous Iowans, and even the state’s rich bicycling history. It’s a small zoo, but still big enough to house 104 animal species, including a giraffe, lion, rhinos, penguins, sea lions and much more. Admission is $14 for adults and $8 for children ages 3-12. Extra charges apply for train rides, animal feedings and carousel or camel rides. Iowa’s most famous natives, from John Wayne to NBA All Star Fred Hoiberg, are featured in this Des Moines museum. The interactive exhibits are fun for all ages, and admission is $10 for adults, $4 for students, and free for Iowa students. This seven-acre public garden in the heart of Des Moines is open year round (with the exception of a few holidays) and offers a variety of kids’ programming at a bargain. Adults pay $10 admission, $7 for kids and free for children 3 and under. Admission is free for members and free for everyone on certain days each year. 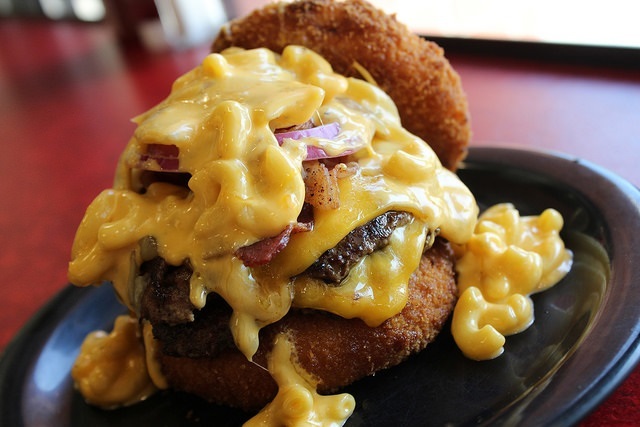 The Walking Ched, a burger topped with mac and cheese, are among the kid-friendly menu items at Zombie Burger in Des Moines. Photo courtesy of Zombie Burger. Eatery A is home to Des Moines’ best happy hour deals. Feed the whole family well and inexpensively by going between 3 and 6 p.m., when all beers, wines and specialty wood-fired pizzas are half price. Breakfast and lunch prices are surprisingly low (like, sandwiches for less than $6) given the high quality of food and pastries at the popular French bakery cafe La Mie Bakery, a few miles from downtown Des Moines. Sit on indoor swings that line the counter at Molly’s Cupcakes while eating sugary frosted cupcakes priced from $1.25 for a mini to $4.25 for a mega-center filled variety. Embrace the townie-bar vibe at Angry Goldfish Pub & Eatery, known for its burgers, spaetzle-topped mac & cheese, and $1 orders of siracha-flavored goldfish crackers (it might make a funny video if you don’t warn the kids about their spicy kick). Finding a table can sometimes be a challenge, so avoid peak dining times. Zombie Burger + Drink Lab. It’s not a budget-friendly spot, but kids love the apocalyptic, zombie artwork and theme. The specialty are their “GORE-met” burgers with punny names like “The Walking Ched” (a burger with mac and cheese).